Happy Wednesday! Here is another Sneak Peek of the new items from the Occasions Catalog that goes live in just a few days. I am loving this paper from the All My Love Designers Series Paper Pack. And the sentiment is snipped from a longer one in the Meant To Be stamp set. Those lovely items behind the sentiment are cut from the Be Mine Stitched Framelits Dies. There are LOADS of hearts in the die set! And think of all you can do with the heart cut outs! Confetti! Do come back again soon for more sneak peeks and projects of all kinds. If you subscribe you won't miss a post! 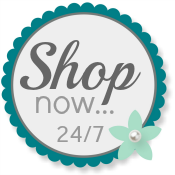 Please shop at my Online Store any time. Next up Valentine's Day. This card is beautiful especially with the die cuts.